The high profile shooting of a Detroit father by a federal agent right in front of his family captured the attention of civil rights groups and grabbed national headlines. Now, more than three years later, a veteran Detroit police officer who witnessed Terrance Kellom’s final moments is giving a different account of the deadly raid. 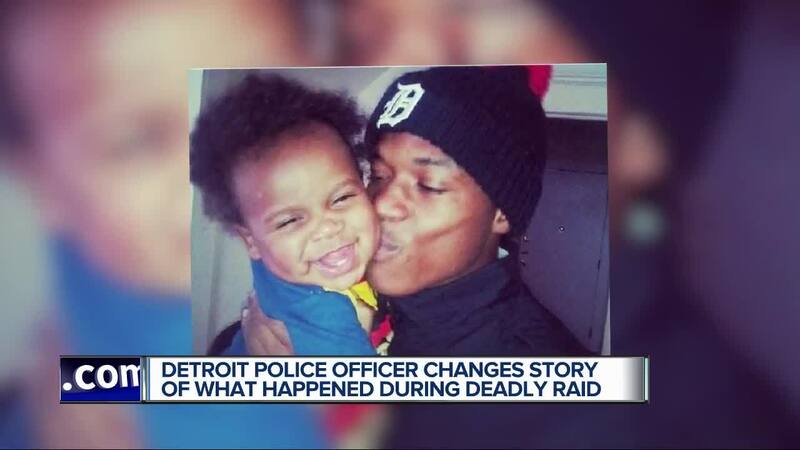 DETROIT (WXYZ) — The high profile shooting of a Detroit father by a federal agent right in front of his family captured the attention of civil rights groups and grabbed national headlines. Now, more than three years later, a veteran Detroit police officer who witnessed Terrance Kellom’s final moments is giving a different account of the deadly raid. “I really commend Officer Fitzgerald for coming forward and the public should commend him. We need more officers like that,” says Kellom family attorney Nabih Ayad. Now, the Kellom family is sharing their reaction to what they call a startling discovery. “His son asks me all the time where is my daddy? Is my daddy coming home?” says Terrance’s father, Kevin Kellom. Kevin says now for the first time, he believes the truth could come out. “That was the most honest thing any man could have ever done, was to tell the truth” says Kevin. His words come after testimony from an officer appears to have broken a code of silence surrounding the death of his son. “When I found out that this officer did that, I told my attorney I wanted to kiss him,” says Kevin. It was April, 2015 when ICE agent Mitchell Quinn and other members of a fugitive raid team arrived to arrest 20-year-old Terrance at a home on Evergreen. Quinn told investigators he opened fire, killing Terrance after the young father dropped down from the attic and rushed toward him with a hammer. But Kevin has disputed that. “He never bailed thru the ceiling. None of that. That was a lie,” says Kevin. Days after the shooting, protesters filled the streets, demanding answers for the family. But a DPD homicide investigation found the shooting to be justified, based on their findings. Just as it seemed there were no more twists in the case, a $50 million dollar lawsuit has delivered a bombshell. A stunning claim from police officer Darell Fitzgerald, a lead member of the raid team there to arrest Terrance for allegedly robbing a pizza driver. Fitzgerald now states there was “no” hammer in Kellom’s hand and his recollection is of Kellom “on his knees” as opposed to moving toward him and Quinn. Terrance’s family members who also were witnesses, have claimed that all along. “My son was upstairs. When they walked him down the stairs I saw him then, and he was being disrespectful. I told him to stop. As soon as he says but dad, bop bop. Two shots rang out. I saw my son stumble back and drop to his knees. Bop. Bop. Bop. Bop. Bop. Bop. Bop,” says Kevin. Attorney Nabih Ayad says he’s certain there was more to what happened than police were telling the public. “Two of those shots were protruded from the back, going forward. Against the angle that agent Quinn was shooting at,” says Ayad. He adds that the raid team didn’t have a proper search warrant to enter the home. In addition, retired state police forensic expert David Balash retained by Ayad, points out more inconsistencies. First, there is the absence of fingerprints on the hammer with Kellom’s blood on it. Also, different looking shell casings, which he says could signify more than a single shooter. A lack of evidence photos is also a factor. We took those same findings to outside expert Dr. Werner Spitz, a renowned forensic pathologist, medical examiner and author, who’s been involved in more than 60,000 autopsies in more than 6 decades. “If he was holding the hammer and holding it tight so it wouldn’t fly out of his hand, it’s subconsciously and imprinting your fingerprints on the hammer subconsciously too,” says Spitz. Feds defending Quinn have urged a judge to dismiss the suit before it goes to trial. Detroit Police, the Wayne County Prosecutor and the city’s law department all cite ongoing litigation as a reason for not commenting when asked. Ayad says that still leaves one burning question. “Chief Craig. Kym Worthy. Now that you have this information, what are you going to do with it. What are you going to do with it?” says Ayad. "We’re also reaching out to the Michigan Attorney General, with a request to look into these new findings. We’re hoping for an independent investigation to be conducted."